After many days of wondering "Why Me? ", it's times like this that have me thinking "How did I get so lucky?" Look at this CUTE picture of both girls smiling at their Nana! Poor Holly has a rash on her face. She seems to be getting more and more allergic to the tape that we use to hold her O2 cannula in place. Hydrocortizone works to clear it up, but it comes back as soon as we put the tape back on:( We would welcome any suggestions on getting that silly cannula to stay in place without using the "Tender" Grips. Well, it's been over a week since my last post, and what a week it's been. For starters, we had an appointment with the pediatrician, Dr. Judge, on Wednesday. Holland weighed in at 8 pounds 13 ounces, and Eden at 9 pounds 1 ounce. Good news on the weight gain! Unfortunately, it kinda went downhill from there. We left the doctor's office and went straight to the hospital to check in for Eden's sleep study. 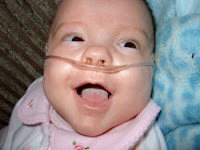 Just as we suspected, Eden made it clear right away that she was not ready to come off her oxygen. She dropped her oxygen saturation into the 60's before they figured out that the equipment was, in fact, reading correctly. She also turned a very unattractive shade of gray. 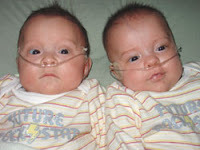 After that happened, mommy and daddy were ready to leave and go home to bed, but the doctor on call insisted that we stay and do the study on oxygen. We really didn't get the point, but we did not want to be uncooperative and go against the doctor's recommendation, so we stayed. Eden slept in an oxygen hood at 30% oxygen. We thought it would have made a lot more sense to keep her on the same oxygen system she is on at home (1/4 liter cannula). At least then we could be sure of how well she does on that at night when she is sleeping. On the bright side, Eden did great, slept the whole time, and did not have any apnea or bradycardia episodes (we knew she wouldn't). So, after a night completely void of sleep, we had an impromptu appointment with the neurologist for Eden. Over the past couple of weeks we have noticed her doing this weird head and arm twitch. It is very mild, and lasts only a few seconds, but she does it at least a couple of times a day. When we mentioned it to the pediatrician, he referred us to a pediatric neurologist. So we got to the appointment Thursday morning and they hooked Eden up to an EEG for three hours, during which she only did the weird twitching thing for 6 seconds. Based on my description of the events, particularly as sterotypic and rhythmic, the doctor said he is 90% sure that she is having seizures. He seemed to want to start her on anti-seizure medication (Tripletal), but I am not completely comfortable doing so. I would not be against medication if we were certain they are seizures, they were harmful in some way, they were making her uncomfortable, and it was the only option, but we really don't have clear evidence that any of this is true. I'd also like more information to rule out possible causes, like maybe related to the nutritional supplements that she is on and/or possible difficulties with the oxygen at home??? I'm afraid that the side effects of the medication might lead to a worse outcome than just leaving things alone. I am VERY afraid to make the wrong decision, but my "maternal intuition" is telling me that she is doing fine and I should just wait to see if this will resolve on it's own. On a positive note, on Friday Holland had her last appointment with Dr. Dass, the retinal specialist who did her ROP surgery. He says that her retinas look nearly perfect, and he does not anticipate any lasting difficulties as a result of the ROP. Holland is now the poster child for ROP surgery! 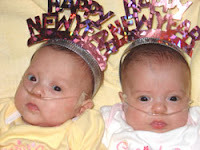 Dr. Dass says that if she had been born just 15 years ago, she would have been blind in both eyes (like Stevie Wonder, who was also a preemie). We are very happy not to have to go to any more appts with Dr. Dass, but it was a great experience having him as a doctor. He is such an intelligent, patient, and compassinate person, and he was so gentle with the babies. When you are going through a stressful and difficult experience, it makes such a difference to have great doctors! 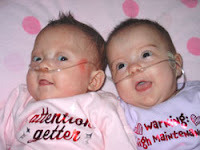 Just before our appointment with Dr. Dass we stopped in for a great visit at the NICU. We finally got to see Ruthann and Eileen! We kept missing them at previous visits. They were very happy to see how much the girls have grown and changed in the past two months:) It was also nice on Wednesday night to be able to see some of the night shift people who hadn't seen the girls since they left the NICU. We had our appt with the pulmonologist on Friday. Things didn't go quite as expected. The good news is that Eden did great when they took her oxygen off, so we have an appt Wednesday to stay the night at the hospital for a sleep study. If she is able to maintain her O2 for 24 hours, then she will be off for good. The bad, and somewhat surprising news, is that Holland didn't do quite so good. 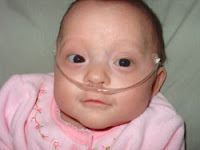 Her oxygen saturation dropped into the 70s after only 6 minutes off the oxygen. The reason this was so surprising is that she is the baby who always required less oxygen in the hospital, and even spent 3 days off of it while in the NICU. For a while, we didn't even think she would need to come home on it! So now we have to wait a whole month until our next appointment to try again... On the bright side, the doctor was VERY impressed with the girls weight gain. Holland had gained over 2 pounds since her last visit. He said that if she was having any trouble breathing she wouldn't be gaining weight so well. So if we have to do another month with oxygen, oh well. Our doggie Zippo woke us up from a sound sleep last night having what we think was a seizure. Very Scary! Anyhow, when we checked in on the girls they were sound asleep cuddled up together. We thought it was so sweet we had to take pictures. They really love snuggling with each other, and with us. The home care nurse came again today and weighed them. Holland is 8 lbs 7 oz and Eden is 8 lbs 9 oz. Just two ounces different, the same as when they were born. Oh, and Zippo is fine and back to his normal self today. We don't know what happened... Hopefully it won't happen again. Next Friday we have an appointment with the pulmonologist at St. Joe's. 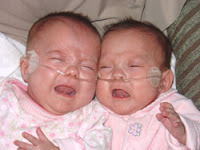 We should find out more then about when the girls might be able to come off the oxygen and apnea monitors. At the last two appts their oxygen saturation dropped pretty quickly when they turned off the oxygen, so they clearly weren't ready. Dr. Hurwitz (the pulmonologist) said that babies are usually ready when they weigh 8 pounds, or are at 48 weeks gestation. We'll be past that point next week, so we are really keeping our fingers crossed. If all goes well at the appointment, we may have to stay a night at the hospital for a sleep study to make sure that they are able to maintain their O2 saturation while they sleep. 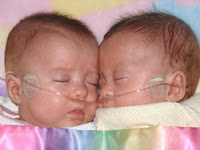 While we are at St. Joe's we will stop by for a visit at the NICU, to see our old friends, and to have blood drawn again. We are having regular blood draws to monitor the girls calcium and phosphorus levels. 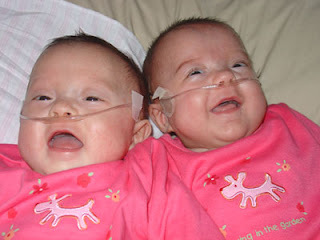 Both girls have Osteopenia of Prematurity, which is similar to Osteoporosis in adults. They have been taking Tribasic Calcium Phosphorus (TCP) supplements to treat the condition and to help build stronger bones. I hope that their bloodwork looks good this time because I would love to be able to discontinue all meds. It will be a happy day when we are off of oxygen, monitors, medication, and fortified breastmilk, and just back to basics. We celebrated Christmas with Nana and Papa on Christmas Eve. 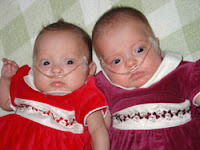 The girls got dressed in their fancy dresses that Aunt Kimi bought. Nana made the traditional Christmas breakfast just for us a day early...YUM. 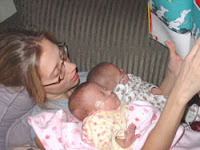 The girls got quilt racks for their bedroom, as well as some Dr. Suess books, among other gifts. On Christmas day we had a few visitors. Uncle Nick and Aunt Sabrina came by with some really cute sweaters, hats, and booties. Grandpa, Aunt Lisa, and cousin Briana came by later in the evening with dinner (YUM) and more gifts all around. We really missed our usual holiday traditions, but it was nice spending Christmas at home with our new little family. We look forward to next year when we take the girls out to all the family parties! New Years Eve was also a bit different this year. No more partying till the sun comes up for Mommy and Daddy! It seems like just yesterday we were ringing in the New Year up in Marquette with Aunt Jess and Uncle Dave. This year they have Aidan and we have Holland and Eden. What a difference a year can make... So, at the stroke of midnight Mommy got the first kiss, then we gave baby kisses all around. Holly was awake and gave us a couple of smiles. Edie slept through the whole thing...what a surprise...Not!